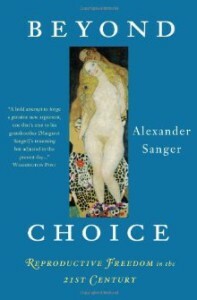 Alexander Sanger is the grandson of renowned reproductive rights activist Margaret Sanger. He has carried on her tradition by serving as President of Planned Parenthood of New York. In Beyond Choice he bravely forges a new set of principles…capable of breaking the current deadlock and forging new alliances between pro and anti-choice lobbies. Sanger recounts past reproductive rights battles, but also goes on to try to assess how the campaign has reached its current impasse. While reasserting the importance of maintaining the choice to have children or not, Sanger makes a case for why reproductive rights are just as important to men (a topic that needs more attention), and for why completely unfettered choice may not be morally defensible. His grandmother would be proud how he is carrying the torch on the continued fight for reproductive rights and freedom and this excellent contribution to the LiveTrue collection of books on social issues.